Let us be real, some of us are not just made for cleaning. Anyone who says that they enjoy it is either crazy or lying. But, do you know what is worst than cleaning? Well, a dirty house. And the unfortunate truth is that no matter how lazy you feel, you are still going to get some dirty work done for the sake of your home. Yes, there are plenty of ways to keep your home looking spotless with minimal effort. We have listed the best house cleaning tips that could help you make your daily chores a little less painful. Check this out! Try to practice the habit of picking things up and putting them away as you walk around the house. Yes, every time you enter a room, give it a quick scan of any clutter or trash. So, instead of ignoring a piece of rubbish on the floor, pick it up and throw it away. You might have paused a minute from whatever you are doing, but when you make an effort to put rubbish where they belong will help prevent it from stacking up. If you feel like you always sweep nearly every day, then you may start requiring everyone to take their shoes off whenever they enter the house. Yes, it may feel weird at first, but you won’t need to vacuum or mop nearly as often. You may take advantage of the cleaning products. Yes, spray a no-wipe cleaner all over your shower every time you use it to keep it fresher for longer hours. You may also use disinfecting wipes and give your counters a quick clean every day. Well, these little yet best house cleaning tips will surely keep you from spending longer amounts of time when you do a deep cleaning. Here’s another thing, instead of scrolling through your phones while waiting from the microwave to ding, what you could possibly do is to look around for something to clean. Put at least one of those disinfecting wipes to use on the stove, start to tackle the dishes or you could sweep the floor. Sounds productive right? Well, there is always something quick to clean that doesn’t need too much time and energy. Vacuuming is one of those you have got to commit to. When you lug that thing out of the storage closet, you know you are in for the long haul. But then what about when you spill the salt or the dog digs dirt out of the houseplant? Well, the last thing you want to do is pull out the vacuum. With handheld one, small messes and peck of dust are sucked away in just a few seconds. Another one of the best house cleaning tips that professional reliable cleaners suggest is to keep your supplies where they’ll be used. You might ask why? Well, here’s the thing. If you notice the bathroom sink is dirty, but you have to go all the way to the kitchen to get your disinfectants, chances are you are going to use that as an excuse not to clean. So, instead, keep doubles to make sure that you will always have the cleanser you need when and where you need it. 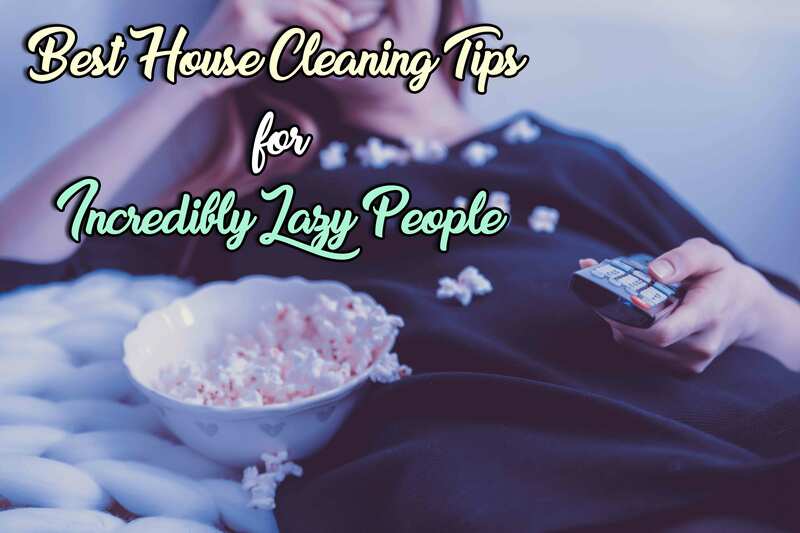 And one of the best house cleaning tips that we suggest to lazy people is to make the task fun. Sound impossible? Well, absolutely no! Dancing around with the broom isn’t just something they do in the movies. So, if it helps you get the house clean, then you can do it too. Put on some music, have a glass of wine while you are tidying up. Note that when you keep your mind occupied on something enjoyable, clearing up your mess won’t be that too bad. And the last of the best house cleaning tips is to reduce your stuff. It may be a simple idea but then think of it, the less stuff you have the less time you will have to spend on clearing up your mess. Likewise, getting rid of things is a big job. But there are ways to do it, just do things little at a time. After all, once you have minimised what you own, your home will naturally look and feel way cleaner. Well, the most important thing to learn from these best house cleaning tips is that it is a lot easier when you take it on a small task at a time. Likewise, these tips really don’t have to require a lot of effort. And it means that your house can look a lot better without you having to make a huge change in your lifestyle. However, if you don’t feel like trying it, then the best thing you could do is look for professional residential cleaning services that will handle the job. Well, Maid in Perth is right for you! Learn the variety of services we have for you by calling us today. Talk with our professional team about your concerns and we’ll be happy to help you out. Also, are you planning to move to a new apartment yet you don’t how to start the cleaning? Then this article is right for you. “Tips on How to Have an Apartment Move in Cleaning”. This entry was posted in House Cleaning and tagged Deep Cleaning, Fridge cleaning, Home Cleaning, Maid in Perth, oven cleaning, window cleaning.